The people referred to collectively as the Aawambo live in central northern Namibia and southern Angola. In about 1550, migrations of these people, who have a common origin and culture, moved southwards from the Great Lakes in East Africa and settled between the Kunene and Okavango rivers. Today four of these groups live in the Cunene Province in southern Angola and eight in northern Namibia, the latter representing just over half of Namibia’s population. The Kwanyama constitute the largest of the eight Owambo tribes. The others are the Ndonga, Kwambi, Ngandyela, Kwaluudhi and Mbalanhu, and the smaller the Nkolonkadhi and Unda. The Owambo languages are Bantu in origin. They are closely related to one another and are commonly understood by Oshiwambo speakers. The Kwanyama and Ndonga languages have been developed into written languages. Traditionally called Ovamboland and today loosely referred to as Owambo, the highly populated northern region of Namibia was divided into the Omusati, Oshana, Ohangwena and Oshikoto regions following independence in 1990. According to the 2011 population census, the Ohangwena Region has the second-largest population in the country, and Omusati Region the third largest. While the majority of Namibia’s Owambo live in these four so-called O regions, many have migrated southwards to other parts of the country. Since 1870, following the advent of the Finnish Mission in Owambo, and subsequently the Roman Catholic and Anglican churches, Christianity has played a major role in the lives of the Owambo people. Today more than half of the population has some link with these denominations. The Finnish Mission Church developed into an independent Owambo/Kavango Church, which also has adherents among the Kavango people of the north-east. In the pre-colonial structure of Owambo society there was a king and headmen in each of the seven Owambo groups. Judicial powers were vested in village and regional courts, with the highest court being the Supreme Court of the King, where the King was assisted by his headmen. This system reflects influences from the great medieval states of central Africa characterised by the sacred king having almost unlimited power. Today only three of the Owambo clans – the Ndonga, Ngandjera and Kwaluudhi – still recognise their kings and are ruled by chiefs-in-council. The rest have a system of senior headmen forming a council and administering their tribes by joint action. An important function of these officials is the regulation of the system of land ownership. About a quarter of the Owambo regions has been claimed by individual landowners, each occupying farms of several thousand hectares. Owambo houses are traditionally of the rondavel type, mostly surrounded by palisades and often connected by passages. Cattle kraals usually form part of the complex, which is surrounded by cultivated lands. The Owambo practise a mixed economy of agriculture, mainly mahangu (pearl millet), sorghum and beans, and cattle husbandry, supplemented by fishing in shallow pools and watercourses called oshanas. Traditional land is utilised according to traditional right of occupation usually acquired by payment of cattle to the ‘owner’ of the ward (omkunda). Grazing and utilisation of veld and bush products are communal but subject to the laws of the people. Trading runs in the Owambos’ blood, as is borne out by the more than 10 000 stalls, cuca shops and numerous locally owned shopping complexes in the region. Large numbers of Oshiwambo people now work in other parts of the country, so that today’s workforces in the mining and fishing industries consist primarily of Owambo people. Most senior civil servants and political leaders speak Oshiwambo. Home industries such as dressmaking, wood carving, pottery and basketry provide an income for many Owambo women, who traditionally cultivated the land and raised the children. Today Owambo women are increasingly entering the labour market as nurses, clerks, shop assistants and teachers. The most striking feature of the traditional Owambo social system is the predominance of matrilineal descent, which determines the laws of inheritance and succession, as well as post-marital residency. In recent years, as a result of external factors such as the Christian doctrine, migrant labour and economic independence, there has been a distinct shift towards a patrilineally organised society. The Owambo people have always played an active role in politics. Namibia’s ruling party, SWAPO (South West Africa People’s Organisation), started as a non-violent pressure group referred to as the Owambo People’s Organisation. It was led by Andimba Herman Toivo ya Toivo and Samuel Shafiishuna Nujoma, the man destined to become the first president of an independent Namibia. A good opportunity to learn about Owambo culture firsthand is by visiting the Uukwaluudhi Traditional Homestead at Tsandi in the Omusati Region. Uukwaluudhi, one of very few traditional kingdoms still in existence, is occupied by the King of the Tsandi area, which falls within the Uukwaluudhi Conservancy. Trained local guides take visitors through the homestead, pointing out the customs and history of these complex family homes. The Nakambale Museum and Restcamp is a community-based tourism institution established at Olukonda in 1995 by the Evangelical Lutheran Church in Namibia (ELCIN). It offers exhibitions on the premises of the National Monument, where the Nakambale Church was built in 1870 when the first Finnish missionaries settled in Owambo. The church is flanked by the Nakambale Cemetery, where Finnish missionary Martti Rautanen, some of his family members, and a number of traditional leaders were laid to rest. Guided excursions to sites of interest such as the Oponono Lake, Omandongo mission station, Onoolongo cattle post and Ombagu grass plains are also offered. Visitors are treated to traditional Owambo food, music and dancing. A visit can be arranged to the historical Omuguluwombase, where the guerrilla warfare waged by SWAPO forces for Namibia’s independence was launched. For generations women in the Oshana, Ohangwena, Omusati and Oshikoto regions of north-central Namibia, where the marula tree is an abundant natural resource, have been harvesting the fruit. They extract the oil and use it as a taste enhancer in traditional chicken and mahangu dishes, and cosmetically as a moisturiser for their skins. 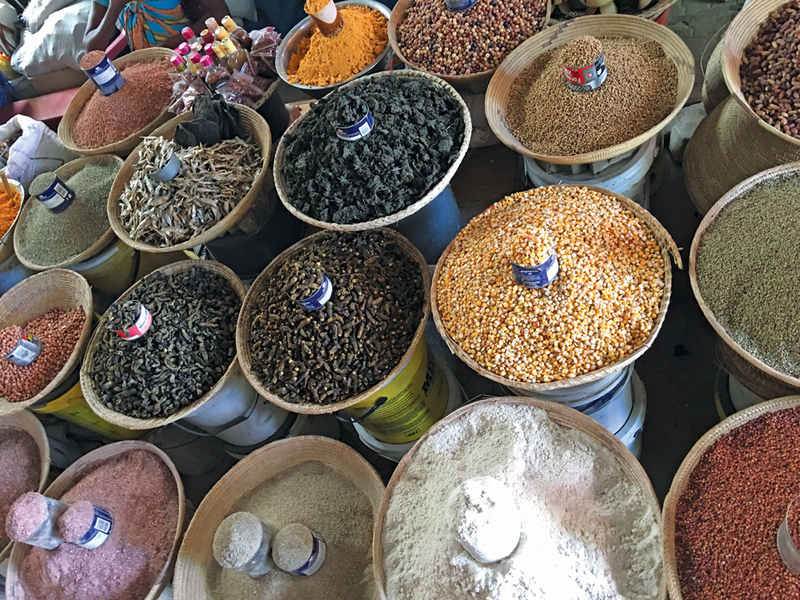 Today the oil of this traditional African food source is being processed and exported as a high-value ingredient for overseas cosmetic products. Namibia is the first Southern African country to export marula oil to Europe. Elaborate hairstyles were particularly prolific among the Owambo, differing from tribe to tribe and characterising the different stages of a woman’s life. Girls in the largest Owambo group, the Kwanyama, wore variations of the elende hairstyle, attained by rubbing a mixture of fat and olukula (a powder made from the crushed root of wild teak) into the hair and lengthening it with leaf fibres and strands of sinew. Cowrie shells were fixed to the ends of these strands of hair. A few years ago six women in the Onenongo village 20 km north-west of Oshakati combined their knowledge and skills to form the Ndilimani Pottery Group. The women use clay collected from the oshanas (flood plains) close to their underground pottery studio. The pots can be bought at the Tulongeni Craft Market on the northern side of the Omuthiya village, 90 km south of Ondangwa. Initiated by Hollander Maggy Kukler in 1999, the Ekwatho Quilt Craft project provides a livelihood to Owambo women in Okuryangava in Katutura, Windhoek. Designs for the quilts are based on four small blocks in two exchangeable colours, from which any number of new designs can be made. 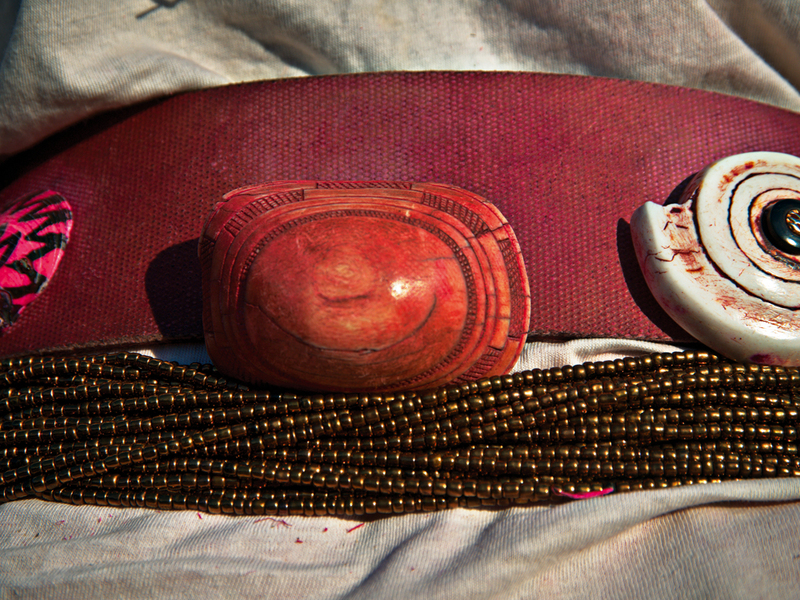 Onyoka, traditional necklaces made from mussel shell beads, play a prominent role in the adornment of Oshiwambo women. New babies are welcomed into the world with a string of onyoka, and throughout their lives Oshiwambo women wear onyoka whenever they want to look smart, especially when attending weddings, christenings and funerals. Ekipas are ornamental buttons made from ivory or bone that were worn by Owambo women in earlier times. Displayed at the back on two leather straps hanging down from the waist, the number of ekipas worn gave an indication of the woman’s status and the wealth of her husband. Ekipas were carved into oval, round, square, multi-cornered or oblong forms with a raised centre, resembling a tiny beehive or rounded pyramid. They were usually engraved with a border in different geometric patterns around the outer edge. Some were fashioned from hippopotamus tooth or bone, and less frequently from vegetable ivory. Today ekipas have become intrinsically and unmistakably Namibian. The ekipa is currently regarded as a cultural artefact that can be sold as a personal belonging in terms of the Convention of International Trade in Endangered Species (CITES). The Ministry of Environment and Tourism has placed a temporary moratorium on the sale of elephant ivory. This affects all artefacts made from ivory, including old as well as new ekipas. The objective of the moratorium, which came into force in 2008, was to give the Namibian Government the opportunity to sort out the technicalities of buying and selling ekipas legally. Just north of Ondangwa, the literacy programme of Nghuoyepongo is presented, providing tuition in English, mathematics and braille. Most members who are part of the Nghuoyepongo programme suffer from a disability. After class, members of the group weave baskets, which are sold at the annual Ongwediva Trade Fair that takes place in August. A visit to the four north-central Owambo regions provides an opportunity to meet the Oshiwambo-speaking people, who comprise approximately half of the Namibian population. This distinctive part of the country is characterised by makalani palms, oshanas (depressions of water that fill up annually during the rainy season, providing the inhabitants with an ample fish supply), mahangu (pearl millet) fields and fenced traditional homesteads. Here visitors can experience the local culture, taste the food and visit the traditional homesteads of these friendly and courteous people. Travelling through the area can be done with ease, as there is a comprehensive network of well-maintained roads. It also provides a linkage with the rest of Namibia, making a good circuit if travelling from the northwest or Epupa Falls to the Zambezi/Kavango Region or into Etosha via the King Nehale Gate, only 44 km from Namutoni. The Nakambale Museum and Restcamp in the village of Olukonda, 14 km southwest of Ondangwa, consists of the old Finnish mission house (now a museum), a high-roofed church and a demonstration traditional Ndonga homestead, with its mopane-pole palisade and huts connected by a labyrinth of passages. Accommodation is available in five tented huts, the traditional huts of the homestead, or at camping sites. A craft shop displays and sells crafts produced in the area. The Uukwaluudhi Traditional Homestead in Tsandi, the former home of King Josia Shikongo Taapopi, is an opportunity for guests to visit a traditional palace. Worlds apart from European palaces, the royal homestead is a typical Owambo homestead, surrounded by a mopane-pole palisade. This African-style palace offers a unique cultural experience, incorporating the customs, beliefs and accommodation style of the Oshiwambo-speaking people into the royal residence. Local crafts of the area can be bought at a craft shop. The hand-made and attractively decorated paper from the Onankali-Omahangu Paper Project is produced by a twelve-member co-operative, located 55 km south-east of Ondangwa. The paper is made using stalks and leaves of mahangu (pearl millet), a staple in north-central Namibia. Recycled paper is added for a lighter colour. Once the paper is made, it is silk-screened with African designs from the San Ekoka artist group. This unique product range includes bookmarks, cards, notebooks, conference folders, loose sheets of paper and magnetised fridge notepads. A further 30 km south, in the town of Omuthiya, Tulongeni Craft Market is brightly painted in orange, yellow and green and surrounded by mahangu fields. The craft shop is an outlet for locally produced crafts, such as baskets woven from palm fronds by the Nyeka ye Pumba group, Onankali paper products and Ndilimani Pottery. Commiphora wood goblets and animals, traditional funnel-shaped fish-trap baskets and Ombalantu wire products are produced here. The Community Forest at Omauni covers an area of 750 km2, with the campsite located in the Centre for Sustainable Forest Management. Rustic furniture is manufactured and sold at the centre.